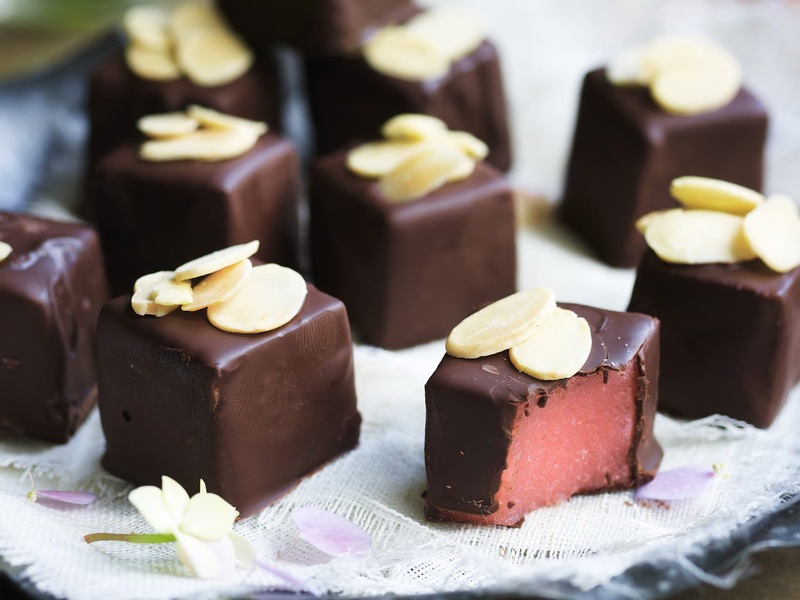 Delicious and chewy chocolate Turkish delights with the sweet scent of rosewater and the crunch of sliced almonds. Grease deep 17cm (6¾-inch) square cake pan. Sprinkle gelatine over the water in a small heatproof bowl; stand bowl in a small saucepan of simmering water. Stir until gelatine dissolves. Stir sugar and ¾ cup of the extra water in a medium saucepan over medium heat, without boiling, until sugar dissolves. Bring to the boil. Boil, uncovered, without stirring, until temperature of the syrup reaches 116°C/240°F (soft ball stage) on a sugar thermometer. Simmer at 116°C for 5 minutes, without stirring, regulating heat to maintain temperature at 116°C. Remove pan from heat. 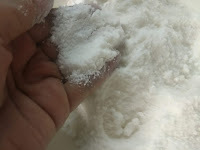 Meanwhile, place cornflour in another medium saucepan; gradually stir in the remaining extra water. Bring to the boil, stirring, until the mixture thickens. Gradually whisk hot sugar syrup, gelatine mixture and glucose into the cornflour mixture; bring to the boil. Reduce heat; simmer, stirring, about 10 minutes or until mixture thickens a little more. Remove pan from heat; whisk in rosewater, tint with colouring. Strain mixture through a fine sieve into cake pan; skim any scum from surface. Stand 15 minutes; cover surface with lightly greased baking paper, stand 3 hours or overnight to set. Melt chocolate. Turn turkish delight onto a board; cut into squares with an oiled knife. Using a fork, dip squares into chocolate, drain off excess; place on baking-paper-lined tray, sprinkle tops with nuts. Refrigerate 1 hour or until chocolate sets.